Nicola Philippaerts (BEL) triumphed in a high class Longines Global Champions Tour Grand Prix, facing down the phenomenally on-form Gregory Wathelet (BEL) in challenging conditions in Cascais, Estoril. The titanic battle for the podium played out under clear skies and a crescent moon, but with high winds of 40 km/h adding to the testing environment for the world’s best horses and riders. Thrilled Philippaerts hailed his grey gelding H&M Harley as “unbelievable” as he celebrated his victory and becoming the latest rider to qualify for a place at the Longines Global Champions Tour Super Grand Prix at the GC Playoffs in December. Tonight’s result sees the ranking unchanged at the half-way point in the 2018 season with overall series leader Edwina Tops-Alexander (AUS) on top with 172 points with Ben Maher (GBR) 29 points behind on 143 points and Scott Brash (GBR) in third on 131 points. Philippaerts moves up to fourth position on 121 points. The first round 1.60m course was littered with serious challenges from the word go for the 35 qualifiers as the sun set over the beautiful Estoril oceanfront and a narrow vertical with a chequered flag at fence 12 to finish the course it was not for the faint-hearted. With full grandstands and the immaculate grass arena ready for action, the swirly wind conditions added to the difficulties around the course with multiple combinations clocking up faults at the GC oxer and the first fence. Experienced duo Ludger Beerbaum (GER) and Chiara were one of many who had trouble at the Longines triple combination - oxer, oxer vertical - leading to his uncharacteristic retirement. It was Piergiorgio Bucci (ITA) and Diesel GP du Bois Madame who delivered the first clear round of the night to the delight of spectators. He was followed by a superb, free flowing clear round from Danielle Goldstein (ISR) and Lizziemary who won the same event last year. They were followed by impressive clear rounds from Philip Houston (GER) and Chalanda. Belgian rider Gregory Wathelet, riding high from success in the GCL competition and two 5* wins the previous nights, produced a fantastic clear round on Mjt Nevados S.
There was disappointment for riders including Marcus Ehning (GER) and Funky Fred who had the final fence down. Lorenzo de Luca (ITA) was hit with four faults at the first fence scuppering his chances of getting into the jump off. Both Christian Ahlmann (GER) and Luciana Diniz (POR) suffered at the double combination. Series leader Edwina Tops-Alexander (AUS) and Inca Boy van T Vianahof retired ending her chance to extend her ranking lead in the absence of closest rivals Maher and Brash. But there were more clears to follow from Julien Epaillard (FRA) and Virtuose Champeix and Christian Kukuk (GER) riding Limonchello NT. Nicola Philippaerts (BEL) and Spanish star Eduardo Alvarez Aznar (ESP) on Rockefeller completed the eight-strong line up for a sizzling jump off. The 8th LGCT Grand Prix jump off of the season was another thriller with exceptional displays from world class combinations. First in the jump off was Piergiorgio Bucci (ITA) and Diesel who opted for a safe clear but with the clock stopped at 47.09 it was unlikely to be the winning round. Danielle Goldstein (ISR), defending her GP title form the event last year, rode another impressive round on Lizziemary. The Chestnut mare responded superbly despite some tricky tight turns and still managed to go clear in a fast 41.72. It all came together for Philip Houston (GER) and Chalanda but their clear round in 42.34 was not fast enough. The threat from fast Frenchman Julien Epaillard (FRA) evaporated and he finished on 22 faults. Tension rose as Gregory Wathelet (BEL) and Mjt Nevados S swept round the course executing sharp turns in a superbly controlled round. His grey stallion ate up the ground in the sweeping arena and came home in 40.93. Nicola Philippaerts (BEL) and H&M Harley were always going to present the major threat and from the start were fast, powering round the jump off course to finish in 39.57 with Nicola pointing his finger skywards in victory. With Christian Kukuk (GER) out of the picture, suffering four faults at the penultimate fence, it was down to Eduardo Alvarez Aznar (ESP) and he achieved great pace to finish in 41.36 and third place. The Tour now gallops to Monaco, past the midway point in the season as the battle for the Championship gathers pace. Duarte Guedes, LGCT Cascais President: "I am really happy that we had a vey good event. It was wonderful sport. I congratulate the riders and the winners." Jan Tops, Founder and President LGCT: "It was a Belgian week, every class was won by a Belgian rider. It was a great jump off and very exciting to the last moment. Nicola’s father won here back in 2006 when the Tour started so it is great to see they keep it in the family. And we have tonight another rider who qualifies for the Super Grand Prix (at the GC Playoffs in Prague in December). We are only half way, there are riders with very strong points and it is going to be very exciting." Edwina Tops-Alexander, LGCT Ranking Leader: "It just wasn’t my week. My horse is still green and I had to do the right thing and retire him today." Eduardo Alvarez Aznar, Third Place: "It is always nice to be on the podium and I hope one time I can be faster or at least the same time (as Nicola). I’m very happy with my horse and the event. I’m very happy with my horse, it was the first time jumping at night and three times clear today." Gregory Wathelet, Second Place: "I am really happy with my horse for his first GP at that level. I know fast riders behind me and I had to try for it. Nicola normally faster than me with the horse I tried I just have to congratulate Nicola today. This weekend was for tase as amazing weekend for me." 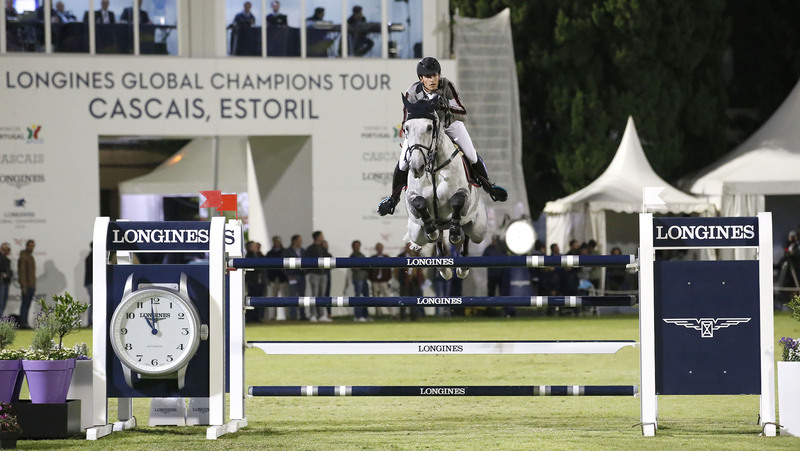 Nicola Philippaerts, LGCT GP Cascais Winner: "I think he (H&M Harley) is in really good shape. We rested him after Hamburg. I can’t thank him more and hopefully he will stay in good shape though the season. It is always nice if you can beat a guy like Gregory, he is known everywhere."